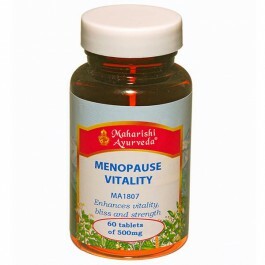 An excellent general purpose preparation for a comfortable menopause. Comfort during menopause is largely determined by how balanced the body is leading up to menopause (perimenopause). For best results start taking it before perimenopausal changes start. Midlife changes can happen gracefully, without discomfort. Symptoms such as mood swings, hot flashes and loss of bone density are related to imbalances in the body, caused by a build-up of digestive impurities. Our midlife formulas help maintain balance and support the functions related to menopause, make the transition smooth and easy. 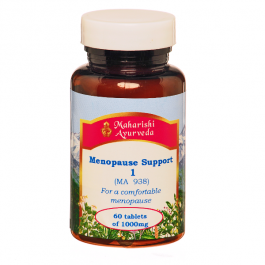 Menopause Support 1 helps the body both before and during menopause. Taken in advance, it prepares the body by supporting the efficient elimination of impurities. 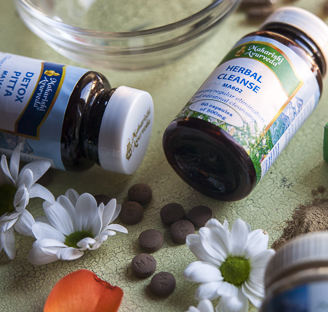 The herbs in the Menopause Support formulas are combined in precise proportions and prepared in the traditional ayurvedic way. This improves the bioavailability of vital nutrients. It also creates synergy -- the collective benefit is much greater than that of isolated, individual herbs. Dry Ginger and Pepper aid bioavailability. Lodha Tree and Sensitive Plant help nourish the uterus and help balance Apana Vata (the downward flow of energy), Ranjaka Pitta (healthy blood and liver function) and Bhrajaka Pitta (the skin). Arjuna helps balance the emotions. Amla nourishes all the tissues and helps the body absorb calcium effectively. 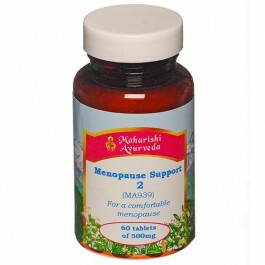 Menopause Support 1 - is an excellent general purpose preparation for a comfortable menopause. Menopause Support 2 - supports menopause when taking Menopause Support 1 - helps maintain balance of emotions and memory. Menopause Vitality - supporting balanced temperatures, libido and emotions. Menopause Temperature Balance - for use when balancing temperature is the main concern. An excellent general purpose preparation for a comfortable menopause. Comfort during menopause is largely determined by how balanced the body is leading up to menopause (perimenopause). For best results start taking it before perimenopausal changes start. Midlife changes can happen gracefully, without discomfort. Symptoms such as mood swings, hot flashes and loss of bone density are related to imbalances in the body, caused by a build-up of digestive impurities. Our midlife formulas help maintain balance and support the functions related to menopause, make the transition smooth and easy. Menopause Support 1 helps the body both before and during menopause. Taken in advance, it prepares the body by supporting the efficient elimination of impurities. 60 tablets, 60g, 10-30 days supply. Take 1-2 tablets 2-3 times daily with water. Not recommended in cases of intestinal obstruction and stenosis, atony, appendicitis, inflammatory colon disease (Crohn's, ulcerative colistis), abdominal pain of unknown origin, severe dehydration.